Grease the blade of a sharp knife with vegetable shortening. Insert the knife into a marshmallow, stopping just short of the other side. Rotate the knife to create a hole in the center of each marshmallow. Fill a disposable decorating bag with peanut butter and twist the top of the bag to close. Snip 3/8 inch from the tip of the bag. Place the tip of the bag in the marshmallow hole and pipe to fill with peanut butter. Fill all of the marshmallows. Insert lollipop sticks in the bottom of each marshmallow. Line a baking tray with wax paper and set aside. Place 1 cup of chocolate chips in a microwave-safe jar or bowl. Microwave at 70 percent power for 90 seconds and stir the chocolate. Continue to microwave at 30 second, then 15 second, intervals until the chocolate is fully melted. Stir well. Dip each marshmallow in the chocolate and tap the stick on the side of the jar or bowl to remove excess chocolate. Lightly sprinkle one of the toppings over the chocolate. Place the pop top-side down on the prepared baking tray. Melt the additional cup of chocolate if needed to finish the rest of the pops. Place the tray in the refrigerator until well set, about 1 hour. This recipe requires 1 disposable decorating bag or zip-top bag and 12 lollipop sticks, which can be found at a craft store or in the craft aisle of a big box store. Finely chop the fruit and nuts, if using, so they don't weigh down the chocolate. To crush the granola bars, place in a zip-top bag and crush with a hammer or mallet. 3 bars will yield 3/4 cup. Everything you love – on one stick. Line up your dozen marshmallows (or more!). Grease the blade of a sharp knife with vegetable shortening. Insert the knife into a marshmallow, taking care not to poke the knife all the way through, and rotate the knife to create a hole. You may even take some marshmallow bits out of there. Create holes in all of your marshmallows. Now fill a disposable decorating bag with 3 tablespoons of peanut butter and twist the top of the bag to close. You can use a zip-top bag if you like, but I much prefer disposable decorating bags. I buy them by the hundreds since they're my favorite kitchen tool. And since you’re going to the craft store for the lollipop sticks anyway… might as well pick some up. Snip 3/8 of an inch from the tip of the decorating bag. Insert the tip of the bag into the hole you made in the marshmallow, and pipe to fill the hole with peanut butter. Fill the rest of the marshmallows. You might not use all of the peanut butter. After the marshmallows are filled, insert lollipop sticks into the bottom-side of the marshmallows (not the side you filled with peanut butter). If the lollipop stick pushes any of the peanut butter out, just shove it back in. You’re ready to dip! If you’re planning on rolling your chocolate-dipped pops in any extra coating like granola or nuts, prepare that now. You can finely chop up dried fruit or nuts, use mini chocolate chips, or place granola bars in a zip-top bag and crush with a hammer or heavy rolling pin. You’ll need about 3/4 to 1 cup of coatings total for all the marshmallows. 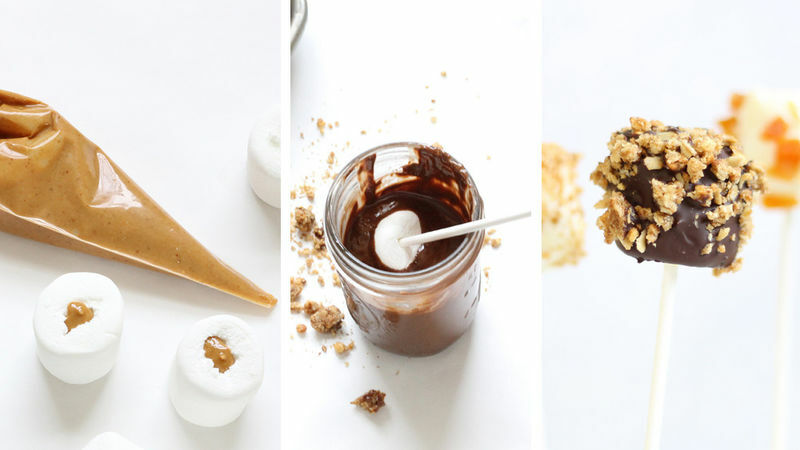 Set these aside while you melt your chocolate. Line a baking tray with wax paper and set aside. For the chocolate, you can use white, milk, dark, or any chips you prefer. Here I used white, milk and dark. Pour a cup of chocolate chips into a microwave-safe bowl. Or, if you’re using different chocolates, divide between several jars or bowls. Melt in the microwave for 90 seconds at 70% power. Stir and continue microwaving in 30 second, then 15 second intervals, until fully melted. Dip a marshmallow in the chocolate and tap the stick on the side to remove excess chocolate. Lightly sprinkle a topping over the chocolate, if desired. Place the pop top-side down on the prepared baking tray. Because the peanut butter stuffing makes these pops less stable, you cannot prop these up to dry or the weight of the chocolate will pull the marshmallow down the stick. Place the whole tray in the refrigerator until well set, about 1 hour. When the pops are set, you can prop them in a Styrofoam™ block to display and serve, if you like. Store any leftovers in an airtight container in a cool place or in the fridge.